Designed by a practising neurosurgeon, Rowena a high fidelity product designed fo Neurosurgical Training Simulation. 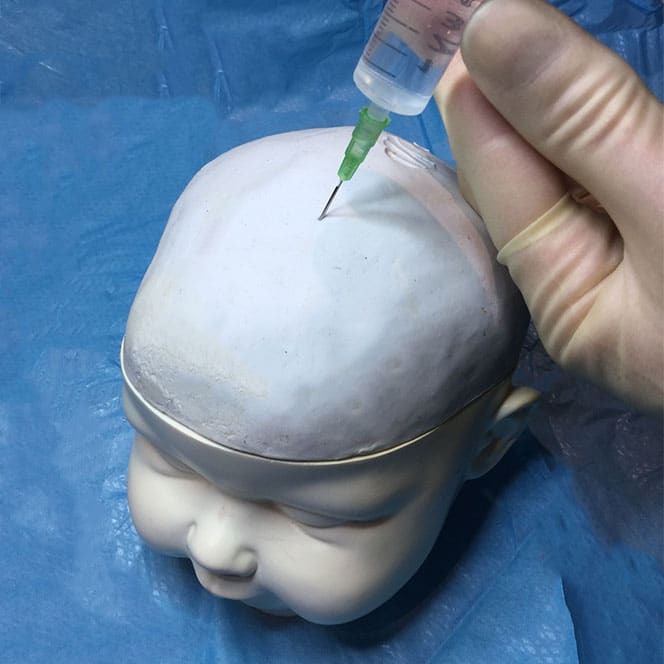 The simulator is available in both adult and paediatric variants for the teaching of basic neurosurgical techniques and approaches in conjunction with common surgical instrumentation. With the recent widespread changes in medical training and career structure the exposure to operative surgery has, generally, been dramatically decreased. Furthermore, many national training bodies have decreed that simulation should be an intergral part of all surgical training programmes. 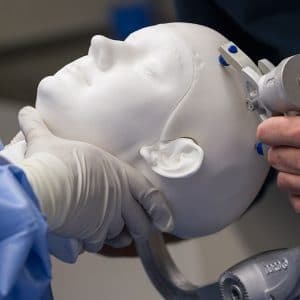 Neurosurgery has definitely lagged behind other specialities in this regard, in part due to the lack of suitable simulators. This is what we have set out to rectify. The Realistic Operative Workstation for Educating Neurosurgical Apprentices (Rowena) is essentially a durable head base, featuring face, neck ears etc, and with accurate internal skull base anatomy. On top of this is fixed a realistic cranium consisting of the skull vault (with accurate vascular markings in the realistically textured bone), overlying scalp layer, and underlying dura (complete with vascular markings). These latter 2 both ‘peel away’ from the bone with a realistic degree of adherence. Within the skull vault is an equally realistic ‘brain’, containing a fluid filled ventricular system for more advanced simulations. Both the cranial vault and the brain are essentially ‘consumables’ which can be inexpensively replaced once they have been ‘operated upon’ to destruction. The head base on the other hand is the permanent part. There are no ferrous metal components making it suitable for both CT and MRI scanning so a very wide variety of procedures and operations can be simulated from head positioning to image guided ventricular catheter placement. Rowena offers high fidelity neurosurgical training simulation which is available in both an Adult and Paediatric versions. Both the Adult and new Paediatric versions of the Rowena Simulator can be purchased either as individual parts or complete kits. The PURCHASE section of this website describes the different parts and kits available and the current purchase options. Complete a form with your requirements and details and we will provide a parts and shipping cost. Alternatively, if you would like to talk to someone call +44 (0)1782 637009 for more information. Find out more about our Adult and Paediatric Training Simulators !